For other uses, see Novalis (disambiguation). Novalis (German: [noˈvaːlɪs]) was the pseudonym and pen name of Georg Philipp Friedrich Freiherr von Hardenberg (2 May 1772 – 25 March 1801), a poet, author, mystic, and philosopher of Early German Romanticism. Hardenberg's professional work and university background, namely his study of mineralogy and management of salt mines in Saxony, was often ignored by his contemporary readers. The first studies showing important relations between his literary and professional works started in the 1960s. The family seat was a manorial estate, not simply a stately home. Hardenberg descended from ancient, Low German nobility. Different lines of the family include such important, influential magistrates and ministry officials as the Prussian chancellor Karl August von Hardenberg (1750–1822).He spent his childhood on the family estate and used it as the starting point for his travels into the Harz mountains. His father, the estate owner and salt-mine manager Heinrich Ulrich Erasmus Freiherr von Hardenberg (1738–1814), was a strictly pietistic man, member of the Moravian (Herrnhuter) Church. Heinrich Ulrich Erasmus' second marriage was to Auguste Bernhardine von Böltzig (1749–1818), who gave birth to eleven children: their second child was Georg Philipp Friedrich. The Hardenbergs were a noble family but not rich. Young Georg Philipp was often short of cash, rode a small horse, and sometimes had to simply walk. Young Hardenberg studied Law from 1790 to 1794 at Jena, Leipzig and Wittenberg. He passed his exams with distinction. During his studies, he attended Schiller's lectures on history and befriended him during Schiller's illness. He also met Goethe, Herder and Jean Paul, and befriended Ludwig Tieck, Friedrich Wilhelm Joseph Schelling, and the brothers Friedrich and August Wilhelm Schlegel. In October 1794, he started working as actuary for August Coelestin Just, who turned out to become not only his friend but, later, also his biographer. The following January, he was appointed auditor to the salt works at Weißenfels. During the time he worked for August Coelestin Just, Novalis met the 12-year-old Sophie von Kühn (1782–1797), a girl who was, according to accounts, a "perfectly commonplace young girl, neither intelligent nor particularly beatiful." Nonetheless, he fell in love with Sophie, since in the young Georg Philipp's view of the world "nothing is commonplace" because "all, when rightly seen, is symbolic." On 15 March 1795, when Sophie was 13 years old, the two became engaged to marry, despite her family's reluctance and the fact that she was already tubercular. The cruelly early death of Sophie in March 1797, from tuberculosis, affected Novalis deeply and permanently. She was only 15 years old, and the two had not married yet. 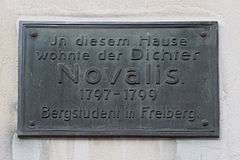 In 1795–1796, Novalis entered the Mining Academy of Freiberg in Saxony, a leading academy of science, to study geology under Professor Abraham Gottlob Werner (1750–1817), who befriended him. During Novalis' studies in Freiberg, he immersed himself in a wide range of studies, including mining, mathematics, chemistry, biology, history and, not least, philosophy. It was here that he collected materials for his famous encyclopaedia project. Similar to other German authors of the Romantic age, his work in the mining industry, which was undergoing then the first steps to industrialization, was closely connected with his literary work. Young Hardenberg adopted the pen name Novalis from his 12th centry ancestors who named themselves de Novali, after their settlement Grossenrode, or magna Novalis. In the period 1795–1796, Novalis concerned himself with the scientific doctrine of Johann Gottlieb Fichte, which greatly influenced his world view. He not only read Fichte's philosophies but also developed Fichte's concepts further, transforming Fichte's Nicht-Ich (German "not I") to a Du ("you"), an equal subject to the Ich ("I"). This was the starting point for Novalis' Liebesreligion ("religion of love"). Novalis' first fragments were published in 1798 in the Athenäum, a magazine edited by the brothers Schlegel, who were also part of the early Romantic movement. Novalis' first publication was entitled Blüthenstaub (Pollen) and saw the first appearance of his pseudonym, "Novalis". In July 1799, he became acquainted with Ludwig Tieck, and that autumn he met other authors of so-called "Jena Romanticism". From Pentecost 1799, Novalis again worked in the management of salt mines. That December, he became an assessor of the salt mines and a director. On the 6 December 1800, the twenty-eight-year-old Hardenberg was appointed Supernumerar-Amtshauptmann for the district of Thuringia, a position comparable to that of a present-day magistrate. Novalis, who was deeply read in science, law, philosophy, politics and political economy, started writing quite early. He left an abundance of notes on these fields and his early work displays his ease and familiarity with them. His later works are closely connected to his studies and his profession. Novalis collected everything that he had learned, reflected upon it and drew connections in the sense of an encyclopaedic overview on art, religion and science. These notes from the years 1798 and 1799 are called Das allgemeine Brouillon, and are now available in English under the title Notes for a Romantic Encyclopaedia. Together with Friedrich Schlegel, Novalis developed the fragment as a literary form of art. The core of Hardenberg’s literary works is the quest for the connection of science and poetry, and the result was supposed to be a "progressive universal poesy” (fragment no. 116 of the Athenaum journal). Novalis was convinced that philosophy and the higher-ranking poetry have to be continually related to each other. 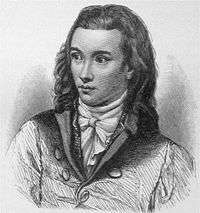 Novalis' whole works are based upon an idea of education: "We are on a mission: we are called upon to educate the earth." It has to be made clear that everything is in a continual process. It is the same with humanity, which forever strives towards and tries to recreate a new Golden Age – a paradisical Age of harmony between man and nature that was assumed to have existed in earlier times. This Age was described by Plato, Plotinus, and Franz Hemsterhuis, the last of whom was an extremely important figure for the German Romantics. This idea of a romantic universal poesy can be seen clearly in the romantic triad. This theoretical structure always shows its recipient that the described moment is exactly the moment (kairos) in which the future is decided. These frequently mentioned critical points correspond with the artist’s feeling for the present, which Novalis shares with many other contemporaries of his time. Thus a triadic structure can be found in most of his works. This means that there are three corresponding structural elements which are written differently concerning the content and the form. Hardenberg’s intensive study of the works of Jakob Böhme, from 1800, had a clear influence on his own writing. A mystical world view, a high standard of education, and the frequently perceptible pietistic influences are combined in Novalis' attempt to reach a new concept of Christianity, faith, and God. He forever endeavours to align these with his own view of transcendental philosophy, which acquired the mysterious name "Magical idealism". Magical idealism draws heavily from the critical or transcendental idealism of Immanuel Kant and J. G. Fichte (the earliest form of German idealism), and incorporates the artistic element central to Early German Romanticism. The subject must strive to conform the external, natural world to its own will and genius; hence the term "magical". David Krell calls magical idealism "thaumaturgic idealism." This view can even be discerned in more religious works such as the Spiritual Songs (published 1802), which soon became incorporated into Lutheran hymn-books. Novalis influenced, among others, the novelist and theologian George MacDonald, who translated his 'Hymns to the Night' in 1897. More recently, Novalis, as well as the Early Romanticism (Frühromantik) movement as a whole, has been recognized as constituting a separate philosophical school, as opposed to simply a literary movement. Recognition of the distinctness of Frühromantik philosophy is owed in large part, in the English speaking world at least, to the writer Frederick Beiser. The six hymns contain many elements which can be understood as autobiographical. Even though a lyrical "I", rather than Novalis himself, is the speaker, there are many relationships between the hymns and Hardenberg’s experiences from 1797 to 1800. The Hymns to the Night display a universal religion with an intermediary. This concept is based on the idea that there is always a third party between a human and God. This intermediary can either be Jesus – as in Christian lore – or the dead beloved as in the hymns. These works consist of three times two hymns. These three components are each structured in this way: the first hymn shows, with the help of the Romantic triad, the development from an assumed happy life on earth through a painful era of alienation to salvation in the eternal night; the following hymn tells of the awakening from this vision and the longing for a return to it. With each pair of hymns, a higher level of experience and knowledge is shown. Walter Pater includes Novalis's quote, "Philosophiren ist delphlegmatisiren, vivificiren" ("to philosophize is to throw off apathy, to become revived") in his conclusion to Studies in the History of the Renaissance. Novalis' poetry and writings were also an influence on Hermann Hesse. Several of Novalis's notebooks and philosophical works or books about Novalis and his work have been translated in English. ↑ Joel Faflak, Julia M. Wright (eds. ), A Handbook of Romanticism Studies, John Wiley & Sons, 2016, p. 334. ↑ David Farrell Krell, Contagion, Indianapolis: Indiana State University, 1998. ↑ Barbara Laman, James Joyce and German Theory: "The Romantic School and All That", (Fairleigh Dickinson University Press, 2004), 37. Wikisource has the text of a 1920 Encyclopedia Americana article about Novalis. "Novalis". New International Encyclopedia. 1905. "Novalis". Encyclopædia Britannica (11th ed.). 1911.